I’ve already posted the recipe for making Medjool Dates crepes, one of my favorite breakfast dishes. Every time I have Medjool dates, I fall for it even more. It truly deserves the title: “King of dates”. 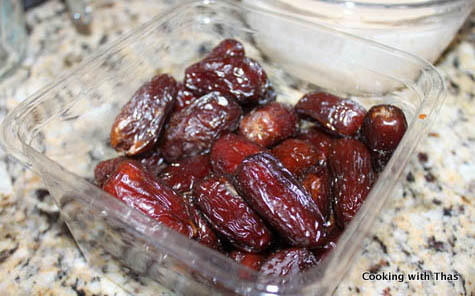 These dates taste so delicious by itself that my husband and I keep munching on it non-stop, of course without any guilt. Medjool Dates- king of Dates! I recommend Medjool dates by Natural Delights: Their dates are 100% natural, fat free and don’t have any preservatives or added flavorings. 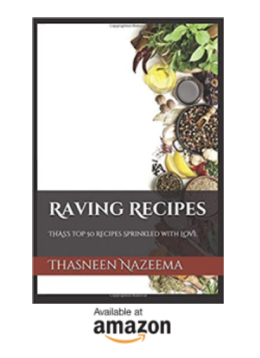 Dates are such versatile dried fruits and can be used for making both sweet and savory dishes. Well, most people have the notion that only desserts can be made out of dates as it tastes sweet. That’s absolutely wrong; delicious savory dishes can also be made with dates. I would say dates get along with chicken so well, it enhances the taste of the chicken and impart so much flavor to it. Dates and chicken has been one of my favorite combinations. Hence, I decided to pan fry chicken in homemade Medjool dates sauce. I infused dates along with star anise and cooked it. Added some seasonings and made a smooth sauce out of it. Marinated the chicken in the dates sauce and pan fried it. It couldn’t get any better! Medjool Dates Sauce: Sweet, spicy and slightly tangy sauce. 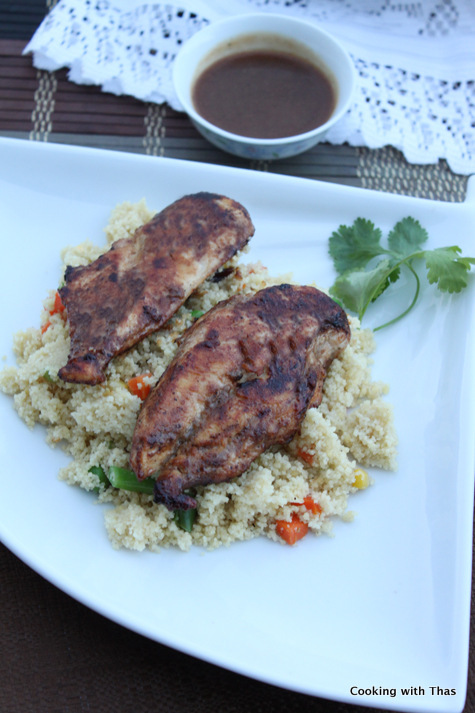 Pan Fried Chicken in Dates Sauce served over Dates-Veggie Couscous- A delicious and nutritious meal! In a saucepan, combine the chopped dates, star anise and water. Place the pan over medium heat and cook the dates till it has turned tender and slightly mashed up. Remove the pan from the heat, discard the star anise, let cool down. In a blender, puree the dates mixture to a smooth paste. Transfer the pureed dates mixture to the pan and place it over medium heat. Add soy sauce, rice vinegar, ground pepper, salt and paprika, combine well. Cook for a few minutes till the sauce has thickened. If the chicken breast is thick, cut it in half vertically. Sprinkle a couple of pinches of ground pepper and salt over the chicken, spread it evenly. 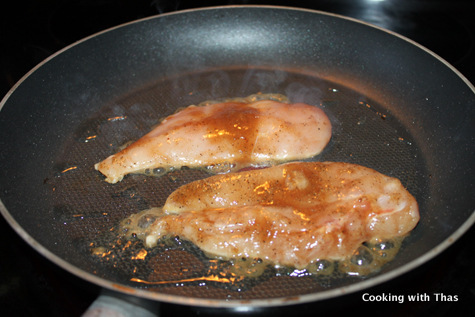 Add 2 tbsp dates sauce for each chicken breast, spread it evenly and let it marinate for 15 minutes. Place a non-stick pan over medium heat, add oil and coat the pan evenly with oil. 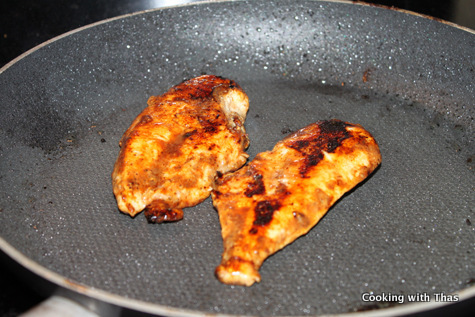 Place the marinated chicken breast on the pan. Let the bottom side cook, flip it over and turn to the other side, let both sides cook well and turn golden brown in color. Add the mixed veggies, saute for a few minutes. Add chopped dates, ground cumin, ground pepper and salt, saute for a minute. Add water and let water come to a boil. Add couscous to the boiling water, cover the pan with its lid and remove the pan from the heat. Keep it covered for 5 minutes, couscous will get cooked. Make a bed of Dates-Veggie couscous on a plate, place the pan fried chicken in dates sauce over it and serve warm. 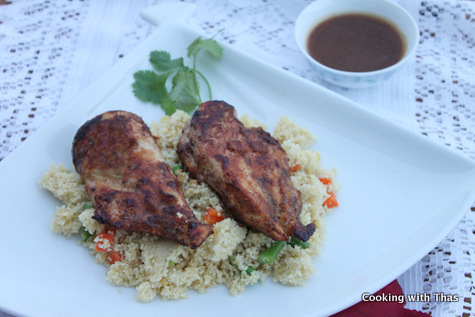 Enjoy the juicy, tender and delicious dates chicken along with dates couscous. 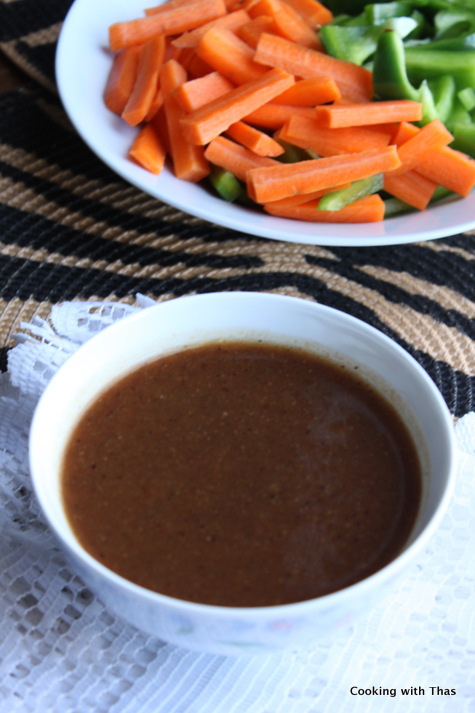 You could use this dates sauce as dipping sauce, for making other dishes etc.